Enjoy this custom wooden Alice Box as our special gift to you. 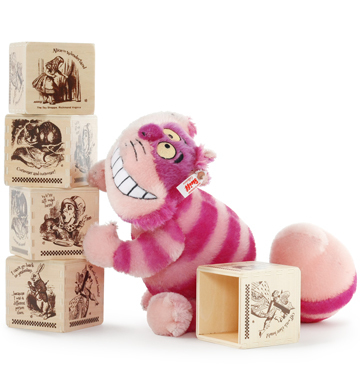 As a special treat, we have designed this wooden Alice Box displaying several of Sir John Tenniel's well-known illustrations from the original Alice books. 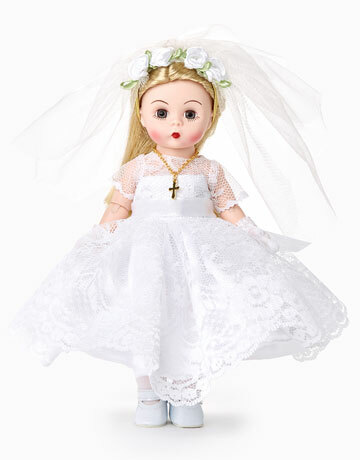 You'll only find this fun & unique accessory at The Toy Shoppe. A wonderful accessory for all lovers of Alice! Please Note: Cheshire comes with only one box. Additional boxes seen in photos shown for advertising purposes only. Fully-licensed by Disney! 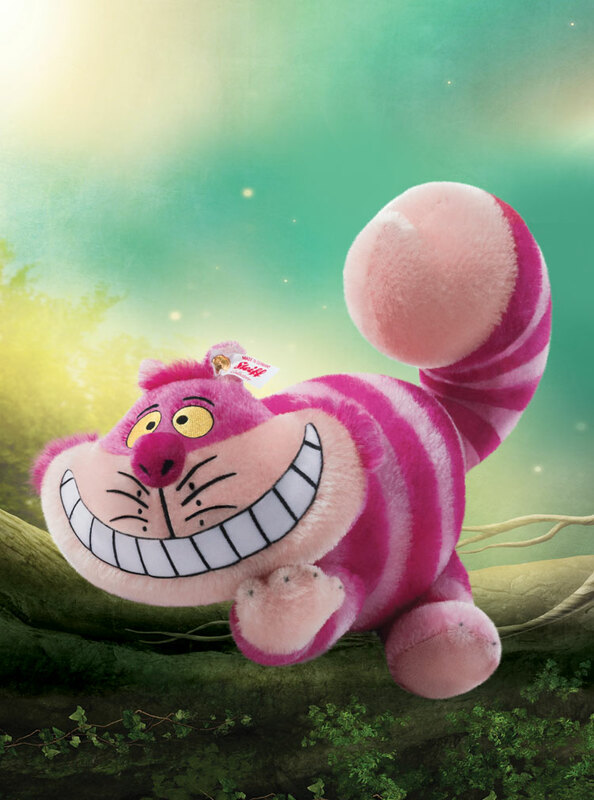 It's been exciting to partner with Steiff again and bring to life one of Wonderland's most memorable characters, Cheshire Cat, exclusively for The Toy Shoppe. We worked very closely with Steiff and Disney to capture his distinct personality: it's as if he has been plucked right out of the Disney animations with his striking pink stripes and curvy tail. Oh, and that mischievous 'Cheshire grin!' 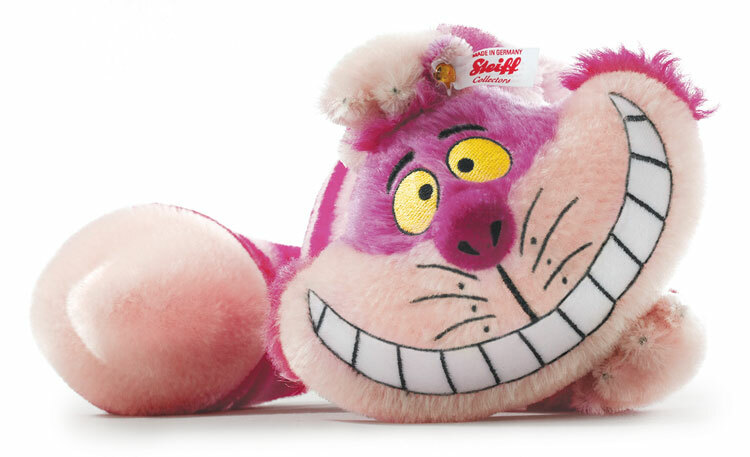 We are delighted to partner with Steiff in bringing to life one of Wonderland's most memorable characters, Cheshire Cat, exclusively for The Toy Shoppe. Since its publication in 1865, ALICE IN WONDERLAND, the tale of a curious girl who falls down a rabbit hole into a wacky world continues to fascinate and enchant people of all ages. Lewis Carroll's writing and Sir John Tenniel's illustrations have inspired countless artists. From books and cartoons, to dolls and Teddy bears, Wonderland continues to stir the creative genius and imagination in us all. This character, as with all of the Disney/Pixar licenses, is made exactly to Disney's specifications. 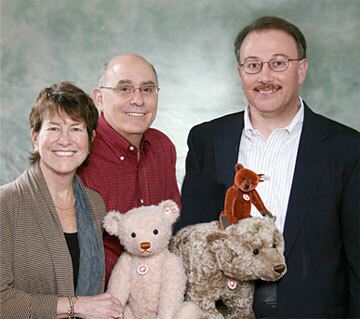 Steiff must follow strict guidelines as far as color, size, accessories, materials, etc. This licensed character has been created and designed, as required by Disney, in the exact likeness from the animated films and is approved by Disney. What started out as just a story for three little girls became a curiouser and curiouser tale that eventually evolved into the beloved books, delighting generations of readers. Charles Lutwidge Dodgson, also known as Lewis Carroll, was an English writer, mathematician, photographer and even a deacon. He is best known for his books of Alice and her adventures in Wonderland. Since 1865, the tale of a curious girl who falls down a rabbit hole into a wacky world continues to capture our hearts. Lewis Carroll's writing and Sir John Tenniel's illustrations have inspired countless artists. From books and cartoons, to dolls and Teddy bears, Wonderland continues to stir the creative genius and imagination in us all. A cult classic in the film world, Disney's past and present adaptations of Alice In Wonderland are by far the most renowned film depictions of Lewis Carroll's complex and very peculiar characters. Walt Disney took interest in Carroll's cherished Alice books long before Disney's first successful animated feature in 1951. In fact, he began working on Alice animations as far back as the 1930s. Originally planned as a live-action animated film, Walt decided on an all-animated film that by the 1970s had become a huge success and delighted viewers of all ages. In the 1980s, it was even among the first Disney films to be available on VHS. Disney's more recent films, directed by Tim Burton revived the classic fable, stirring an excitement among Alice fans. The creative minds at Disney have a special touch when it comes to the whimsical world of Wonderland. Their depictions of the imagery and characters, including the Cheshire Cat, are known for their authenticity. Always puzzling and quite comical, Disney has made this classic character the star that he is today. When you think of the Cheshire, the classic Disney animations instantly come to mind. 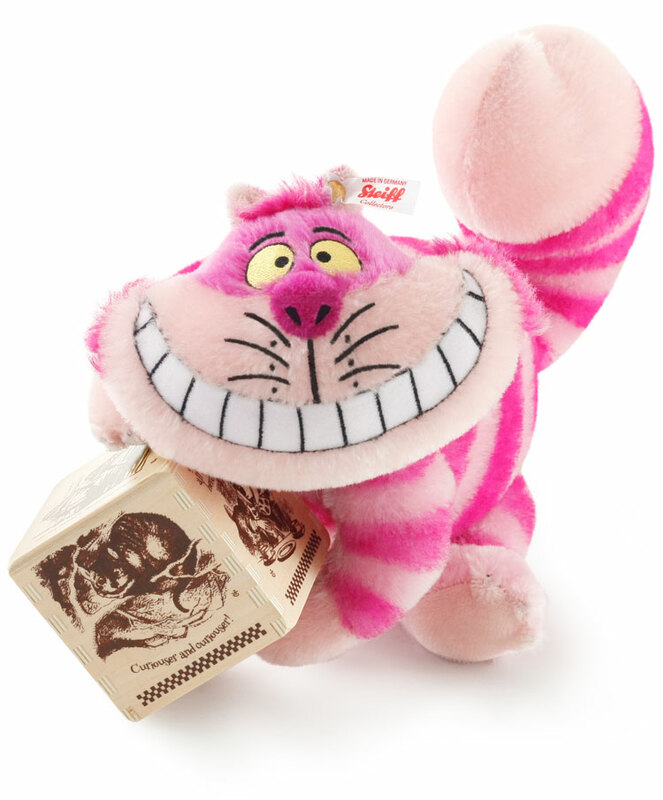 From his colorful stripes to that ear-to-ear grin, Cheshire Cat has long been a fan favorite. 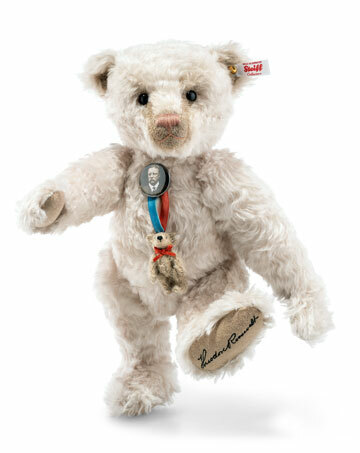 We are proud and overjoyed to present this charming character as our latest Steiff Exclusive! Special shipping offer for Cheshire Cat. Limited time offer.